…and equipping them to serve, love and honor Him every day. The AWANA organization is leading Kids Worldwide to Know, Love and Serve Christ. Each year AWANA typically runs from September-May and is held at Faith Baptist Church in Warwick. 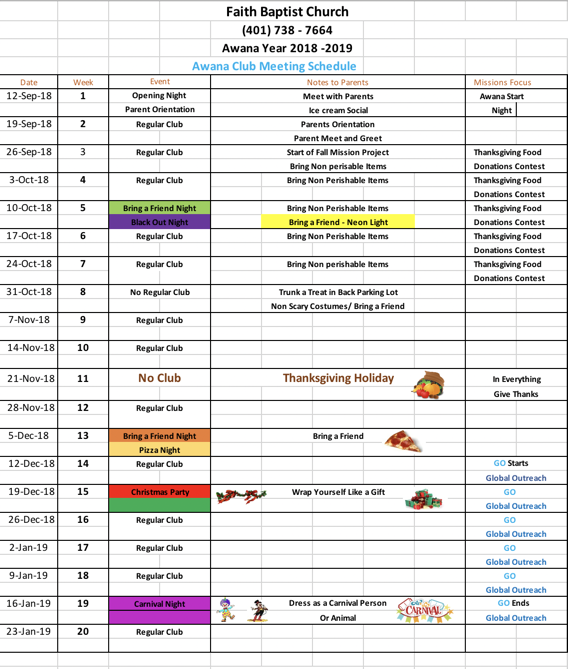 Below you will find all of the necessary details pertaining to our active AWANA program that serves hundreds of kids each year. Faith Baptist Church has a been involved in the very popular AWANA International Ministry for over twenty years. AWANA is a Bible-centered youth ministry program that provides local churches with weekly clubs for children Pre-school through Sixth Grade. AWANA helps churches and parents work together to develop spiritually strong children and youth who faithfully follow Jesus Christ. Our programs offer a proven approach for evangelizing and discipling kids in the church and community. As a ministry leader for 60 years, AWANA is making an impact. A recent national survey found AWANA to be as important to our alumni’s spiritual foundation as all other church activities combined. Among alumni who participated in our programs for at least six years, 92.7 percent still attend church at least weekly as adults! Each week, more than one million kids ages 2 to 18 participate in AWANA. Over 12,000 churches in the U.S. and more than 8,000 internationally run AWANA programs that change young lives through biblical truth. At Faith Baptist Church, our AWANA Program typically runs from September through May, minus certain holidays. 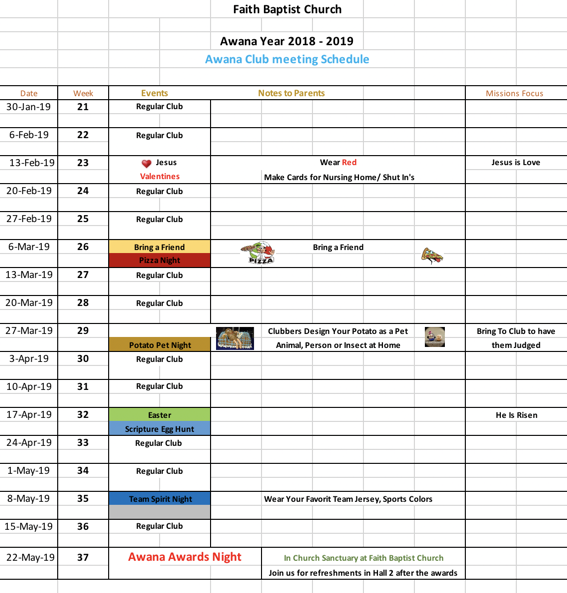 2018-2019 AWANA Ministries will run from September 12, 2018, through May 22, 2019. We accept new members throughout the program time period. Our Club meets every Wednesday night from 6:45-8:00 PM. If you are interested and would like to receive information about the program or want to attend contact us by Clicking Here. Would you like the full document?